Maxon Motor have created a range of products with EC-powermax motors that are particularly strong because they offer high performance for their size. The EC-powermax 22 has a high torque at slow speeds compared to other similar-sized brushless DC motors. 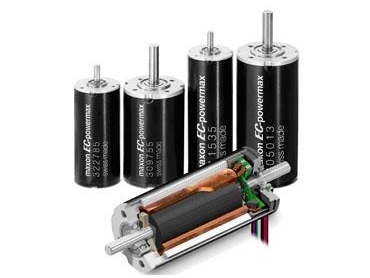 The EC-powermax 22 complements the 30mm option with a 22mm diameter motor and performance of up to 120 watts and like the EC-powermax 30 is available in two lengths. The existing rotor comprising 2 pole pairs is fitted with good magnetic material. For electronic commutation, the magnetic field is sensed through Hall sensors and the rotor position detected. Maxon Motor’s winding technology, optimised for powermax motors, also delivers better performance benefits. All the benefits of brushless DC motors with air-flux winding (‘ironless’ winding, system maxon) also apply to the 4-pole version. Like the EC-powermax 30, the EC powermax 22 has no detent because of the grooveless stator, resulting in good control characteristics which are particularly beneficial for positioning operations. The EC-powermax 22 is available in two lengths in the standard program, with an operating range of 90 to 120 watts depending on the version. Maxon Motor’s modular system means that it can be combined with 32mm planetary gearheads. Maxon Motor also offer the corresponding electronics for operating and/or controlling the motor. The new EC motor is suitable for applications where top performance is required per volume and weight unit such as medical technology or generally for handheld tools such as slicing and drilling machines.